Kepa's arrival at Stamford Bridge came shortly after Chelsea had agreed to sell Belgian international 'keeper Thibaut Courtois to Real Madrid for a reported fee of 35 million euros. 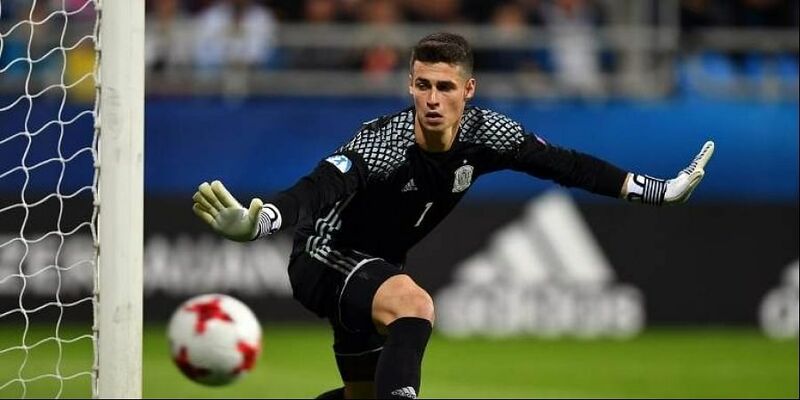 LONDON: Spain's Kepa Arrizabalaga became the most expensive goalkeeper in history on Wednesday after Chelsea confirmed his 80 million euro (£71.6 million, $92 million) move from Athletic Bilbao. The 23-year-old has signed a seven-year contract with the English giants. "It's a very important decision for me, for my career, and also for my personal life," Kepa told Chelsea's website. "So many things attracted me to the club, all the titles the club has won, the other players, the city, the English Premier League. It's an accumulation of things, and I am very glad Chelsea has decided to trust me and to take me in as well." Chelsea were forced to look for a replacement for Courtois ahead of Thursday's transfer deadline for Premier League clubs after he failed to report back to training following his fine World Cup performances on Monday. Courtois had just one year left on his contract and made clear his desire to return to Madrid, where he spent three seasons on loan with Atletico, to be closer to his two children. Chelsea's lack of forward planning for the new season has been much criticised as Antonio Conte's departure as manager and the appointment of Maurizio Sarri as his successor was delayed until just a month before the new campaign. Just seven months ago, Kepa's buyout clause was just 20 million euros and it was he who looked set to join Real Madrid in January. However, after that move collapsed due to former Real boss Zinedine Zidane's wishes not to make mid-season changes, Kepa signed a new seven-year deal with the Basque side that dramatically increased his release clause and has cost Chelsea dear. "Kepa is a talent we have admired for a long time and we are extremely excited about his arrival," insisted Chelsea director Marina Granovskaia. "He has already demonstrated fantastic quality and consistency and will be a big part of any success Chelsea have in the coming years. "His long-term contract reflects the belief we have in him and we look ahead to the coming seasons with an enormous sense of optimism." As part of the deal taking Courtois to Madrid, Croatian midfielder Matteo Kovacic will join Chelsea on a season-long loan deal from Real. Just weeks after Liverpool broke the record transfer fee for a goalkeeper in a deal worth up to 72.5 million euros for Brazilian international Alisson Becker, the inexperienced Kepa, 23, now inherits the title of the world's most expensive goalkeeper. Earlier on Wednesday, Bilbao confirmed that Kepa had paid his buyout clause at the league's headquarters in Madrid to free him from his contract with Athletic. He has played 53 times in La Liga for Bilbao over the last two seasons, and made his international debut in a 5-0 friendly win over Costa Rica in November 2017. He was also in the Spain squad for the World Cup in Russia as back-up to David De Gea, but has yet to make his competitive debut for Spain or play in the Champions League.